I never like to smother you guys with Black Friday deals or sale overload this time of year. But you already know that! 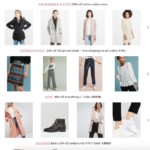 I usually do just one post for Black Friday highlighting the best online sales, discount codes, and favorite items from each. I’m trying something a little different this year though and featuring some of my favorite retailers leading up to Black Friday. Early Black Friday Sales: Save HUGE on Over the Knee Boots!